BOSTON, Sporting Alert – Jaylen Brown and Jayson Tatum led three Boston players in double-digit scoring and the Celtics beat the New York Knicks 110-89 on Tuesday night. Brown shot 9 of 16 from the floor and went 3 of 6 from 3-point range to score 23 points, which was just two points shy of the career high he set in last week’s season-opener defeat to the Cavaliers. 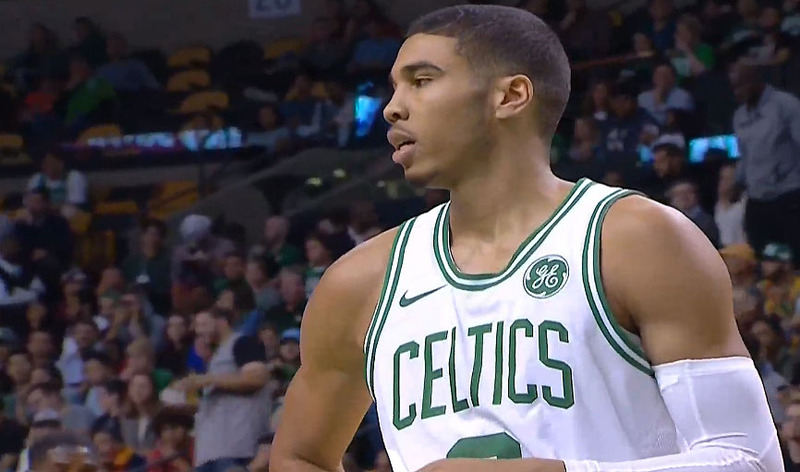 Rookie Tatum went 9 of 15 from the field and knocked down four 3-pointers on his way to 22 points four rebounds, four steals, two blocks and two assists for the Celtics, who were without guard Marcus Smart after he sat out his second straight game with a sprained left ankle. Elias Sports Bureau revealed that Brown, who was celebrating his 21st birthday and Tatum, became the first 21-or-under duo ever to score 20 or more points in the same game in club history. “We’re gonna keep getting more comfortable with each other as time goes on,” Tatum said. Boston head coach Brad Stevens added about the pair: “I‘m sure I’ll say it down the road or tomorrow, or whenever I‘m asked … they are young guys, but for us to be in the situation that we’re in, they’re (just) guys. ”We need them to be guys, so … I was just asked and I’ll deal in reality and let everyone else praise them and we need them to play well on Thursday (at Milwaukee). “We’re in a situation right now where we’re going to expect a lot out of those guys, we need them to be great, we need them to respond to adversity, we need them to respond to pats on the back just the same. Kyrie Irving added 20 points and seven assists, while Al Horford finished with 13 points, 13 rebounds and five assists for Boston (2-2), which has now won two straight after losing back-to-back games to start the season. Daniel Theis ended with 11 points and five rebounds for the Celtics, who shot 49 percent and made 14 shots from 3-point range. Enes Kanter led the New York Knicks with 16 points and 19 rebounds. Kanter grabbed 16 of his total rebounds in the first half along with half of his points. Courtney Lee scored a season-high 13 points and Kristaps Porzingis, who left the contest with 4:44 remaining, and Willy Hernangomez each had 12 for New York, which shot just 42 percent and was 1 of 12 from 3-pointers. Boston Celtics will next head on the road to begin a two-game road trip on Thursday at the Milwaukee Bucks, while New York Knicks head home to entertain the Brooklyn Nets on Friday.